A plaque commemorates continuous service by the Bank of New South Wales at the Railway Square site from 1860 to 1960. 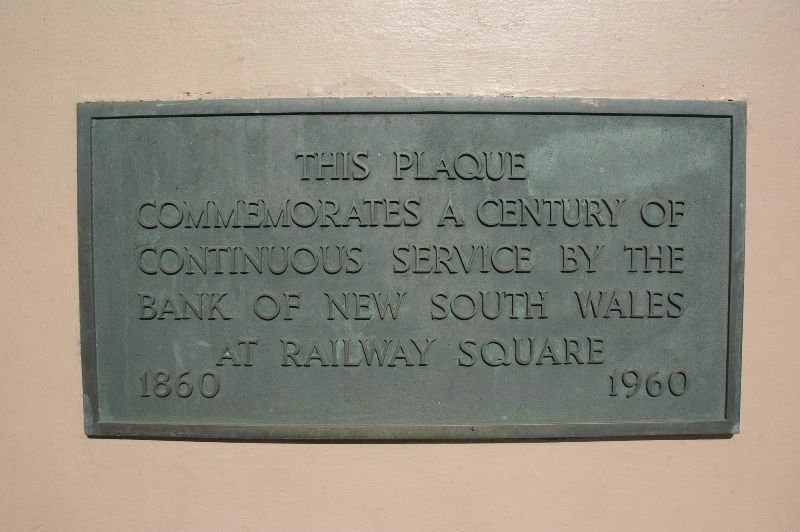 The Bank of New South Wales, now Westpac, occupied this site continuously from the 1860s. It was part of an important financial group; a gold refinery and smelter was based in the next building making the bank important in the gold bullion trade. The building now on this site dates from 1894. It was designed by Varney Parkes and was built by the McLeod Brothers at a contract price of 17,400 pounds. It was substantially extended in 1915 to a design by John Reid. At the same time alterations were made to the existing building. John Reid & Son continued to be responsible for changes to the building during the 1920s and 1930s. In 1921 for example, the firm designed a garage and coke bunker. Throughout the later 1940s and 1950s several alterations were made to the offices including major works by Robertson & Marks in 1949. Another significant program of alterations and additions was initiated in 1969 at a cost of $90,000. In 1975, alterations were made to the ground floor. 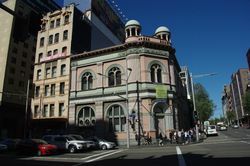 The final and significant work on the building occurred in 1989-90 when Westpac undertook a program to refurbish the building. Despite Westpac’s extensive refurbishment of the building in 1989-90, the bank was hit too hard by the recession in 1992. By 2000, the building that had once been the bank’s pride and joy was ‘For Lease’ .